Dr (Prof.) Uday Salunkhe, Group Director played the perfect host as he anchored the session on ‘Overhauling Our Education System to meet India’s Human Capability Needs’ at 15th national conference organized by NHRD Network at Palace Grounds in Bengaluru recently. 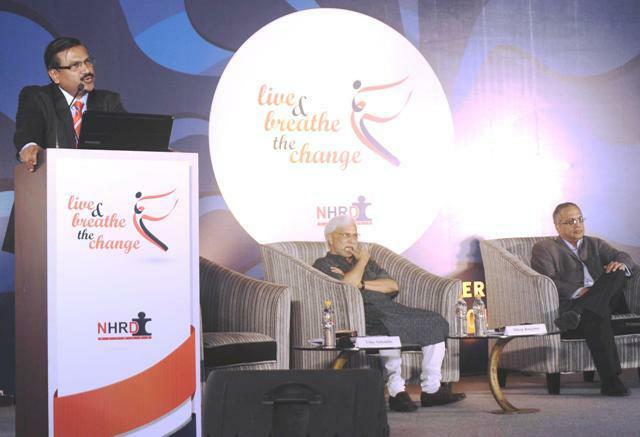 The theme of the conference was ‘Live and Breathe the Change’ . The guest speakers were all leading luminaries from academia. Mr. Dileep Ranjekar – CEO, Azim Premji Foundation , Mr. Anand Sudarshan – CEO, Manipal Education and Dr. Pankaj Chandra, Director, IIM – Bangalore. Dr Uday Salunkhe with his characteristic intellectual gravitas welcomed the speakers to the dais, as he introduced them to the audience. Mr Dileep Ranjekar – CEO, Azim Premji Foundation, was the first among the speakers to share his thoughts with the audience. He said that education alone can bring about the much needed social change; it is a very powerful tool for the same. Talking on the same he listed inequity, injustice and complete lack of care both at human and environmental levels as the three major threats currently facing society. He expressed his concern and dismay over the abysmal state of education in the country along with the unawareness of the government policies among people. Other bottlenecks in streamlining the educational process include lack of accountability for poor performance, instability and inconsistency of governments which change frequently and neglect by politicians that gets reflected in poor budget allocations. In a shocking revelation, Mr Anand Sudarshan – CEO, Manipal Education said that around 93 percent of workforce most of the organisations is not adequately skilled or trained for their jobs. They need some sort of ‘repair’. It is a sorry situation but the fact remains. Talking of the strengths he said that India as a nation is blessed with a huge reservoir of entrepreneurial talent with a high aspirational quotient. Dr. Pankaj Chandra, Director, IIM – Bangalore, described India as the only researchers’ paradise left in the world because of the dynamicity of the Indian society though he lamented the dearth of really good academicians. The role of an academic is much bigger than that of a teacher. As leaders, as recruiters, we should take in people who are good thinkers, researchers , analytics and have a holistic approach. They will definitely make good teachers and would guide and mould the young minds in the most desirable fashion. But sadly there are very few intellectuals who consider academics as vocation. The speakers unanimously agreed on the vast talent pool, which with proper training and relevant skills can unleash a completely new world of immense entrepreneurial possibilities. An updation of our policies along with educating the public about these is also called for . Curriculum and evaluation practices should also be engineered to meet the career and industry demands of any given programme. Dr Salunkhe wrapped up the session with a volley of interesting questions from the audience.